Stained glass, a tune up for the soul. This is the text of a talk I gave to the Stained Glass Association of America at their summer conference on June 30, 2010. It is the result of many years trying to understand how we see a stained glass window. A subtext for this talk was the idea that stained glass has the potential of being the most expressive of artistic media. The staging of the presentation was very simple. I prepared a loop of photographic images of my stained glass windows that were projected while I presented the text to the audience. 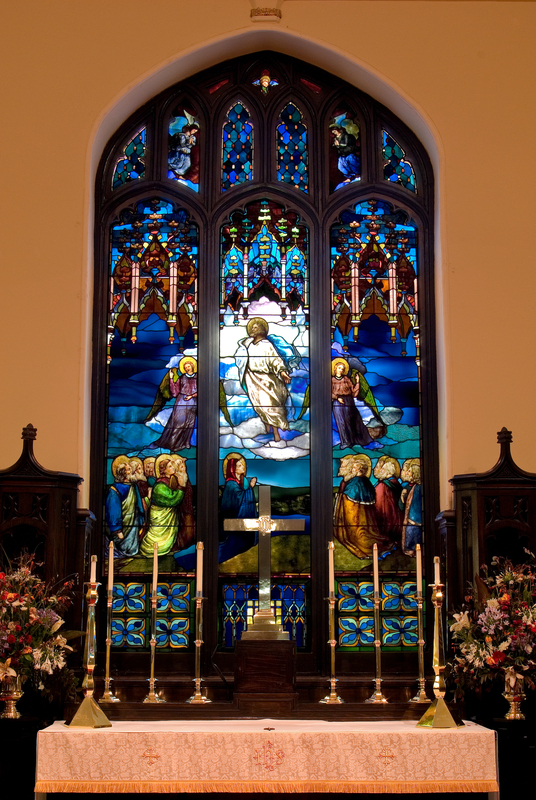 Because the history of stained glass is inexorably mixed not only with the bricks and mortar of the Christian church but its theology and beliefs as well, there is a bias in this discussion. The principles of human perception of stained glass certainly apply to architectural art glass as well. I have discovered that we are all in the business of seeing and believing; of being conscious of our world and trying to make sense of this magnificent gift of life. All of my research for this talk raises the question in my mind why does stained glass fascinate us? We perceive color, movement and meaning on a conscious and subconscious level. The human mind developed to allow us to react to visual stimulus. You reach instinctively to catch a falling object before it drops. You apply the brakes in your car not thinking but reacting to danger in the road. We will discover that stained glass teaches us in a similar instinctive way. It begins for me in 1973; I was sitting at a desk across from Paul Dufour, in a critique of my semester’s work in stained glass. Paul was the art professor at LSU that had single handedly brought to life one of the few college level programs in stained glass education that has existed in the United States. He was known to make people cry in critiques, to burrow down in their psyche and make people question their commitment to being an artist, did they have the goods? Thankfully in our meeting Paul was open and willing to allow me to share my thoughts and budding opinions about stained glass. I can remember saying that the art in stained glass would be enhanced by the nature and quality of a particular glass, that it wasn’t just the relative warmness and coolness of the color in relationship to others, or its lightness and darkness. Paul agreed that the glass mattered but he taught from a design view colored by his study of the research done by the artist Joseph Albers. But I left that meeting with the thought that what if it was the nature of the glass itself, its transparency, shading, unique texture -that would be on par with the color design as taught by Albers – then this would make stained glass a true form of art. When I began my writing for this talk I realized that I have spent the last 37 years following this meeting with Paul in search of an answer to the question I posed for myself in the presence of a brilliant and difficult man. Let’s move forward to 1987 when I spent a few days in France, primarily to study the ancient windows of Chartres cathedral. I wanted to register in my own mind through sense and perception what I felt being in the presence of these masterpieces of our history. On the train ride from Paris I imagined being a serf, and what my life would have been like, attached to a piece of land for life. Color in my world was very limited. Limited to the colors of the earth in shades of brown, grey, blue and only brightened by the color of flowers, sunsets and blood red from injury. My eyes were trained to see the few feet between me and the ground. I lived too far from the village of Chartres to go there often but being faithful I would travel there on feast days. As I walked, I would have known I was getting closer; glimpses of the spire of the cathedral became in time carved stones so tall that as I stood in the shadow I thought surely the spires touched heaven. Entering through the doors so huge I became as a child again, transformed by the color, color so rich it seemed as if I was walking through it, the priestly incense creating clouds of color so vivid in my mind that I would be inspired by the gospel stories I had been told were in the images of the stained glass windows. My drab world of soil and rough woven cloth became one of transcendent beauty with my spirit in commune with God in His Heavenly Jerusalem. Peter Miller, the first time I saw Paris, Times Books, copyright 1999, Random House, New York, NY. When I read this I remember standing there in Notre Dame and when I looked at the great north rose window I had a feeling of vertigo, that the window was a great cosmic wheel and that somehow it was turning clockwise like the whole earth was rotating around the center of the window and I was nearest to the center of God as I ever would be. This is one of the greatest mysteries of stained glass – were people’s vision a thousand years ago more acute and could they make out the shapes and forms more clearly? Would have being in the presence of these symbols so seemingly unintelligible been transforming in ways that we can ever truly understand? A decade later I wrote this next piece. I was attending my first Icon writing workshop at St. Mary of the Pines Retreat Center and was reading Iconostasis by Pavel Florensky. Florensky was a Russian educator and philosopher who wrote about orthodox spirituality and the icon. And his writing inspired me to think differently about stained glass. Since then I have been working to understand this idea. 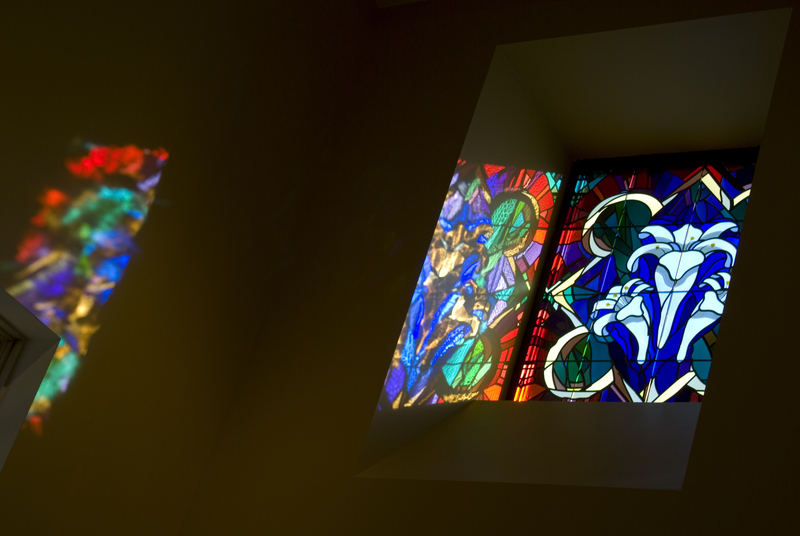 It has opened an avenue of research into the human perception of stained glass and has served as a catalyst to deepening my spiritual understanding and discernment of the task of designing stained glass. Episcopal Church in Natchez in our studio. The artist had used opalescent glass to create the picture plane, but the background glass was hand blown antique left unpainted to allow the effect of transparency to remain in the area depicting the view into a landscape. This transparency allowed the view beyond the window to become a part of the design by accentuating the idea of depth. This was the very idea I had been forming in my mind, it was a humbling experience realizing my discovery was known then as it has been for a 1000 years. What happens when we look at a stained glass window? Projected light, light filtered through the colored glass enters the eye through the cornea, the exterior part of the eye we can touch, and if the light is dim our pupil opens up the aperture to allow in more light so the image can be deciphered more clearly. As it passes through the lense, muscles surrounding the eye manipulate the lense to focus the beam of light on to the retina – specifically the macula lutea, the yellow spot. The outer limits of the retina are covered in visual receptors called rods that collect the dimmest light and are sensitive to movement. In the center of the retina are other visual receptors called cones that discern colors and the precise edges of forms. It is interesting to note that in the fovea where the image is focused there are no cones that sense the color blue. And it is colored yellow as a way to balance the blue light so its color does not degrade the other colors reaching this area. The cones see blue, green and red. Information is transferred to the bipolar neurons and into the ganglion cells that leave the retina and reach the lateral geniculate nucleus. Where the ganglion cells leave the eye no cones exist creating a blind spot. The brain fills in this blind spot in our field of vision automatically. The signals for color and form are then emphasized before being broadcast onto the visual cortex. The visual cortex then interprets the sensations of sight into information understood by other parts of the brain needing to know what and where. The eyes receive the data but it is the brain that actually sees. The fact that our eyes are a few inches apart serves to create depth perception through binocular vision. When someone is looking at a detail in a window the data is received in different parts of the eye. These patterns of information are kept separate to be deciphered by the visual cortex where the objects are located in space. The contrasting elements of light and shadow and color are vitally important to the brain in understanding what it sees. By creating a window that engages the tool of binocular vision, by giving the window contrasting elements of transparency, opacity and translucency, the mind is challenged and becomes engaged in the process of understanding what it sees. All of this is further enhanced by the application of color to the mix. The human mind begins very early in recognizing objects as patterns – a visual short hand to interpret the world we see. If the mind had to consciously decipher all of the visual information it receives every moment our eyes are open it would not have much capacity for anything else. This learning to see over a lifetime – creates a unique opportunity with each person who sees a window – we all interpret what we see differently. We break down the stream of visual information into a series of recognizable patterns that are easier and quicker to understand. Children demonstrate this when they draw a tree, a house, a flower. They draw symbols not the way a tree looks in real life but as stick figures in symbolic and visual shorthand. We each respond differently to our memories associated with the same stimulus. Each viewer of a window will see what they want to see, or what they can see. We often talk about contemporary design as being abstract. Librarians know that an abstraction is a condensed version of a larger whole. In the process of creating abstraction as a designer one’s own history of perceptions and knowledge is brought to bear in a way that reinforces the theme. 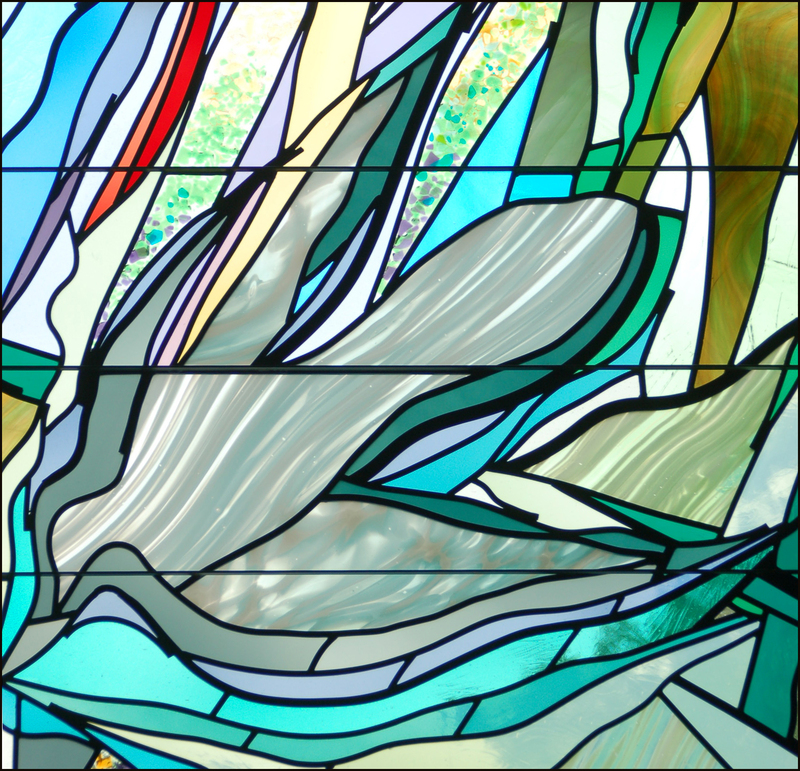 What is our responsibility as stained glass artists? Our goal is to create a sensation that influences the behavior of the viewer in a profound and meaningful way. The earliest stained glass attempted to create a heavenly Jerusalem “on earth as it is in heaven”. Since symbolism and meaning are defined separately for each individual we may not or cannot understand the effect our creations have. Each moment the windows are seen the viewer is in a state of flux of cycles that revolve very slowly for them. The theological aspect and context of the windows helps to ground us. Religion asks us to understand universal truth. If our goal is to positively affect people then the result of color and perception on the human psyche is a valuable tool. Why do I think that stained glass has the potential of being the most expressive of artistic media? Studying the practice of icon writing I came across an article by author Robin Cormack that seems to say that modern western art criticism misses the point when trying to describe what is good and bad art when considering the icon. It is the intent of the artist – their religious conviction – that is overlooked. I judge that the same difficulty can be applied to stained glass. Most art historians and art critics miss the point behind stained glass. It is not easel painting, sculpture, theater, film, music or opera – though it shares much with its kin. Stained glass operates on its own separate sensibility, its own laws and principles that those who judge do not understand. Even after a lifetime I believe I have only come to but a modest understanding of this medium’s potential. In some ways we must depend on the religious nature or at least the sensitivity of the viewer to complete the picture. We have learned that stained glass is uniquely positioned to take advantage of the way that we see. Stained glass is projected not unlike images from a television screen. Wall mounted art work, easel painting, framed prints, all of these will look essentially the same when you walk into a gallery or turn the lights on in your room. Reflected light is not primary light. The kinetic nature of natural light, light that moves across the surface of stained glass will create dramatic and subtle changes. In the end we have to ask the viewer to participate, to slow down and let the subtleties of the kinetic light enliven the surface. Stained glass is often in rooms where contemplation is desirable, and if not required, then certainly needed from time to time. In these quiet moments stained glass becomes an opportunity to return to the beginning through the effects of color and perception on the human psyche. Modern man is bombarded with a 24 hour news cycle and a sea of information that threatens to drown us in minutia. Stained glass is prepared for those that need a tune up of the soul – even if just momentary in a work- a-day world. A silent symphony of color and symbol that reaches out to us on a level beyond the intellect that reaches out to us from a Heavenly Jerusalem. It is this perception of subtlety that is so necessary for our time. Stained glass can certainly be narrative. And as authors of these stories in glass we ask the viewer to enter the world we have told through images, symbols, forms, colors, and engaging the sense of perception. Like radio where the narrative is heard but the story is imaginary, in stained glass the viewer has guideposts to a narrative that they can imagine for themselves. And like great novelists, we do our best work when these guideposts of content do not tell everything in minute detail but allow the viewer to see openly to allow them the freedom to create their own story and be their own heroes – if only for a time. When the French “nineteenth-century arts and restorer Eugene-Emmanuel Violet-le-Duc was a child, his mother took him to Notre-Dame Cathedral in Paris. Captivated by the great rose in the north transept, the boy cried out, “Maman, ecoute, cést le rosace qui chante!”” (Listen, Mama, it is the rose that is singing.) We describe so much about stained glass design with words common to music, harmony, rhythm, and musicians talk about the colors of a particular piece of music. The sound waves that create the music have their corollary in the wavelengths of the spectrum of light. When you walk into a quiet room, and there is no one there to play music or to turn on a radio the stained glass windows will always be on and emanating their complete range of harmonies and rhythms. Have I met the standard of proof? Have the last 37 years taught me enough so I can answer the question posed by a young man 21 years old? It is not only the nature of the glass itself but the perception of it that singles stained glass out as the great art form that it is. I am an artist working with glass for 38 years. My company Pearl River Glass Studio, Inc. is underway in a major business expansion adding 10,000 sq. ft. of studio space to our existing facility in Midtown Jackson. We are designing and manufacturing kiln formed architectural art glass. We collaborate with architects, interior designers, and artists to explore what is possible with glass as an art form. Visit the Pearl River Glass Studio FaceBook page and our website at www.pealriverglass.com. And if you are ever in Mississippi let me give you a tour of the studio and show you what we have found is possible with glass and meet our talented group of artists and craftsmen. This is truly inspiring. You’ve given me a lot to think about. Ed, thank you for the comment. I will be delivering the lecture, Human Perception of Stained Glass, on Sunday, November 21, 2010 at the Cedars in Jackson, Mississippi. I will have more visuals which add to the subject matter in ways that are significant. I do hope it gives everyone something to think about. The potential for glass as an art form is immense. But why do you call it “human” perception? I am of course reacting to your title because of all those book titles where this clarification or limitation sounds just as strange and sometimes funny. Andy, I enjoyed your walk around on the functions of the miraculous eye and brain and observations of their interactions and potentials. Also the thoughts about how the humble Frenchmen might have viewed the window – much common ground there for all to consider. Fundamental too is the attention given to the narrative that historically has been part of the fiber and fabric of this art form. It is no less important or significant than the cave drawings of bison or the carvings of earlier civilizations that immortalize a story, a context, or a paradigm. You garnered my attention too with the reference to the modern mediums of communication which can overwhelm sensibility and reasoned thought with their fluidity, volume, and changeability. Stained glass does invite reverie and stillness which is essential to the healthy life of the mind, even the eye. It is worth noting that there are many airline pilots who limit their viewing of movies and television due to the fatigue and strain placed on the eye. And in the action charged world that many of us live in, the fixed presence of stained glass provides a sustaining and beautiful reference to the world that is good for the soul too. Thanks for posting your thoughts. I guess I better get back to work now. Andrew Young discusses the stained glass windows in the chapel at Givens Estates. Andrew Young on Pearl River Glass Studio, Inc.
Pearl River Glass Studio, Inc.